What are your plans after graduation? Have you ever thought about working for Alpha Sigma Alpha? Traveling as a consultant is an experience of a lifetime. Leadership consultants travel across the U.S. from August to April providing leadership training and educational programming to Alpha Sigma Alpha collegiate women. 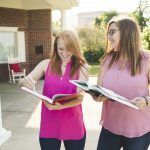 Before hitting the road, these women receive a month-long intensive training that covers everything from Alpha Sigma Alpha’s recruitment philosophy to how to mentor a member. As a national representative of the Sorority, you will enhance your communication and leadership skills, broaden your independence and travel experiences, expand your career opportunities, develop relationships and enjoy networking with college and fraternal professionals, students and alumnae. Applications are due each year on January 10. Video conference interviews for selected candidates will be conducted in late January and early February. Applicants chosen to continue in the process are notified in February. Continuing applicants attend the consultant interview weekend at national headquarters in March. Consultants are selected by April. Questions? Contact the Christy Adams, director of collegiate services. What DOES a leadership consultant DO? Leadership consultants focus on the operations of a chapter. This includes recruitment, public relations, membership education, academic excellence, service and givingfinance, standards resolutions, Panhellenic items and ritual.